Hello ... Hello ... my old friends ... It's great to see you once again! 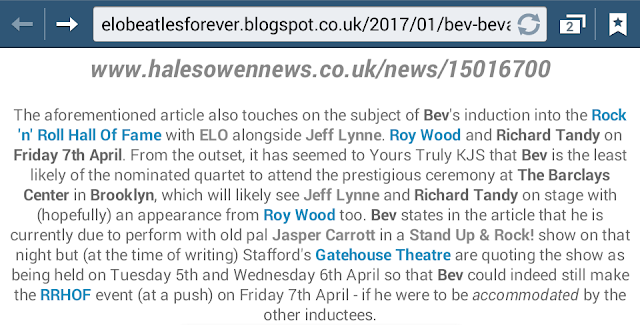 ELO co-founder Bev Bevan confirmed earlier today in a statement via his official Facebook page what we most likely expected in that he will not be joining Jeff Lynne, Richard Tandy and Roy Wood when the Electric Light Orchestra are (finally) inducted into the Rock 'n' Roll Hall of Fame (RRHOF) next month on Friday 7th April. "Unfortunately I will not be able to attend ELO’s induction into the Rock & Roll Hall Of Fame due to the fact that I am on tour in the UK with another great friend of Jeff, Richard and Roy ... the legend that is ‘Jasper Carrott’. These dates have been sold out for sometime and when the news broke about our induction it was too late to change them. It would have been fantastic to meet up with Roy, Jeff and Richard again. I would also like to mention a few other names that I think should be recognised as part of what made ELO so magical - in particular Mik Kaminski, Hugh McDowell, Melvyn Gale and the late Kelly Groucutt. It truly is a great honour to be a part of the Rock & Roll Hall Of Fame especially when I see the names of the inductees over the years … many are my heroes, some I have had the honour to meet and others the privilege to share a stage with. I have been incredibly fortunate to have had a life in the music business from my first band ‘Rocking Ronnie & The Renegades’ to ‘Black Sabbath’ and all the bits in between including The Move, Denny Laine & The Diplomats, Carl Wayne & The Vikings, Quill, The Electric Light Orchestra, the Brum Rocks concerts, Stand Up & Rock and more … surrounded by great talented musicians. It has been a blast and I still get a buzz every time I walk out on stage. However, I would like to add that without the support of the record buying and concert going public my great career could never have happened. So a huge thank you goes out to everyone who has ever purchased a record that I played on or been to any of the concerts. Hope to see you soon at a gig somewhere. Cheers! Bev Bevan"